Asparagus grows from long-lived rhizomes that spread underground. The spears are the tender young shoots of Asparagus officinalis that grows into a fernlike plant over a metre tall when harvesting ends. The spears start pushing through the ground in early Spring. In recent years, a variety of ‘early-season’ asparagus has been developed enabling some producers to get an Asparagus crop to market ahead of the game. Normally, the asparagus farmer has a few weeks of frantic activity harvesting the crop for market, and then it's all over until next year. Traditionally, in the UK, the season begins around St George's Day (23 April) and by mid-Summer's Day cutting should stop. The plants continue to put up spears but these are allowed to grow into tall fronds that photosynthesise in order to build up nutrients in the rhizome for next year's crop. In November the plant is cut back to ground level. It takes about three years for an asparagus crown to become established and, if treated right, it can be productive for 10 years. Harvesting of Asparagus has to be done by hand. The white version is even more labour intensive as the growing spears have to be banked-up with soil to produce the blanched stems. Popular since the 18th century, white asparagus has a more delicate flavour than the green. If exposed to light after harvest, white asparagus will turn yellow or reddish. Purple varieties of asparagus are high in anthocyanins, though, like other purple and red coloured vegetables, cooking results in loss of this colour and it turns green. This all adds up to making asparagus one of the most expensive treats of spring and early summer. Freshness is key to taste so, when you do finally get your hands on it, don't let it linger in the fridge or it will lose its sweetness. The spears are packed with beneficial nutrients - vitamins A and C, folic acid, potassium and iron. They have a natural snap-point separating the tough from the tender parts, so, it’s best to bend the spear and snap off the base rather than cut it for cooking. Young, fresh spears don’t need to be peeled but later ones benefit from peeling the lower 6cm or so. The first, fresh Asparagus are fantastic eaten raw. Slice thinly, and toss in a vinaigrette of lemon juice, olive oil, salt and pepper. 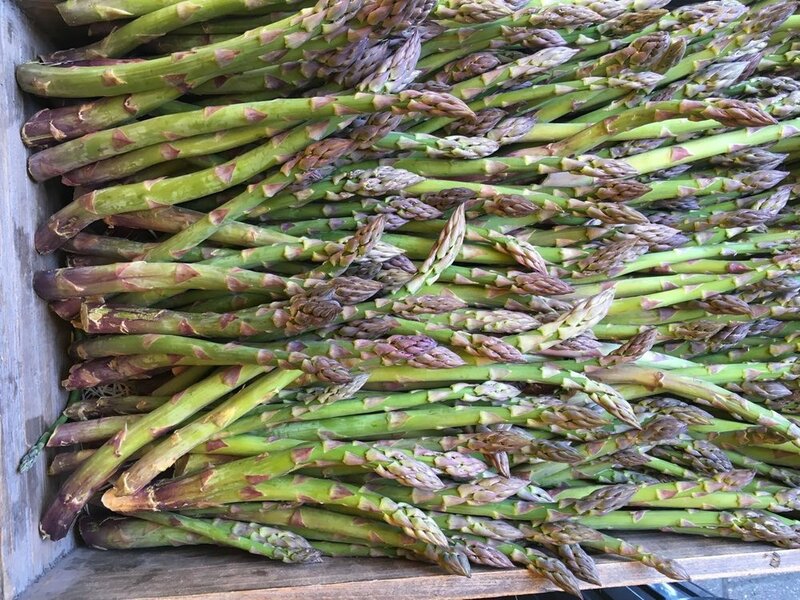 The wispy early spears marketed as ‘Wild Asparagus’, or later thin spears known as sprue, are wonderful for par-boiling then adding to an omelette or frittata. Thicker spears can be plunged into boiling water for a few minutes until just tender – melted butter, mayonnaise or hollandaise sauce are good accompaniments. Asparagus has an affinity with eggs so pairing them is a very good idea. To cook the spears on a griddle or to roast them in the oven in olive oil, par-boiling for one minute in boiling water first is recommended.